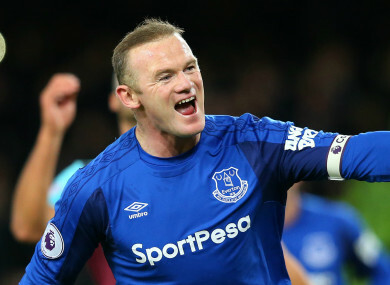 WAYNE ROONEY HAS helped restore a smile on the face of Everton fans, and the former Manchester United striker boasts the best shot-conversion rate in Europe’s top five leagues this season. The former England captain has hit five goals in his past four Premier League appearances, including the winner in his side’s 1-0 victory at Newcastle United on Wednesday. Everton consequently made it 10 points from a possible 12 as part of their resurgence under Sam Allardyce, and Rooney — who returned to Goodison Park in July after a 13-year spell at Manchester United, where he became the record goalscorer in the club’s history — has another reason to smile. Rooney’s shot-conversion rate stands at 37.5%, the forward having hit nine Premier League goals from his 24 efforts so far this season. In second place behind Rooney is Monaco’s Radamel Falcao, with 14 goals from 42 shots for a shot conversion rate of 33%, while Real Betis forward Antonio Sanabria has the same figure thanks to his seven La Liga goals from 21 shots. Other strikers of note in the top 10 include Inter captain Mauro Icardi (30.77%) and Paris Saint-Germain’s Edinson Cavani (30.36%). Email “Resurgent Wayne Rooney has Europe's best shot-conversion record”. Feedback on “Resurgent Wayne Rooney has Europe's best shot-conversion record”.